A collection of featured summits, conferences & more that reach us to reach you. A perfect corner for global summits. The Department of Mechanical Engineering, Karunya Institute of Technology and Sciences, is all set to kick-start the 2014 edition of the annual National level Technical Fest, PITSTOP. This much awaited event among students - not only of the host department but others as well - will provide a platform for students to showcase their Engineering dexterity and claim accolades whilst competing against peers on a National level. 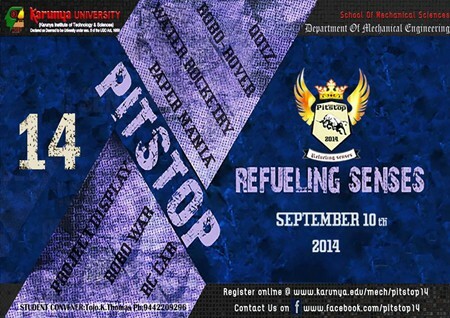 PITSTOP, pioneered by the KSMS batch of 2006, originally intended to bring together students of the Department of Mechanical Engineering for a time of fellowship and camaraderie, saw unprecedented evolution through each edition culminating into the formation of a National level technical fest where ideas and solutions are put forth. The theme for this year's edition, keeping in line with the vision of Karunya's Founders has been chosen as "Innovate for a better society". The theme aims at promoting recognition of societal problems and providing revolutionary solutions that are both effective and economical. With over 700 invitations delivered to external Universities, this year's edition hopes to rope in students internally and externally en masse. In addition, technical events such as Paper presentation, Project display, Robo War, Robo rover and the like are to be held to attract young, energetic and innovative minds. Ancient Rome marveled at the sight of Gladiators engaged in brutal Combat against each other for glory in the Arena. Gone are those days when men fought against each other to their deaths. The days of mighty gladiators such as Spartacus and Gannicus have come to an end only to welcome battle between Man Made Monstrosities of destruction. Robots armed with weapons will take the stage as gladiators to annihilate each other. Witness sparks and bolts fly literally as the Bots battle it out in the arena. Innovation is not merely a concept but also a sustainable process and a manifestation of originality in thinking, and in conceptualizing the natural inventiveness of the mind. Stretching minds little further than the normal thresholds have resulted in great innovations. These innovations are born in the form of projects. Innovatia provides an excellent platform for the showing practicality of the tech-enthusiasm minds of today's mechanical engineers. The participants can present projects related to the field of mechanical engineering. Paper Mania is a technical paper presentation event which invites students to put forward their research work. The event consists of two rounds. The shortlisted research papers in the first round are to be presented in front of dignified intellects who judge the participants on the basis of topic, content, presentation of the research paper and the future work they intend to do. Refresh and energize your mind and body by playing with the very basic instrument of our mechanical world, the Lathe. Prove that you are a 'class apart', not confined to just book knowledge but are also experts when it comes to getting your hands dirty to complete the task. In this event the candidate must produce the given component with accuracy. A wave of nostalgia hits us as we think of the time when model rockets with the help of paper, were created by our own two hands. Here we bring you another opportunity but on a different scale. Test your intelligence in designing a rocket, watch your water powered rocket achieve lift off. Have you ever experienced the adrenaline rush when you saw a rally car fly past you over a hump? Pitstop'14 gives you the rare opportunity for you to experience the same feeling on a miniature scale when you see Remote controlled Nitro Cars fly over humps and obstacles. Build a RC Car which should cover the given track in the minimum possible time. Electric motor or IC engines can be used to power the car. The arena is a proper racing track. The ground clearance of the car should be between 10mm to 50mm. In racing, service bay is allowed once, whereby the battery may be changed and/or other modifications done. The maximum allotted time is 20 seconds. This time will not be counted in the lap time. Exceeding this limit will be counted in lap time. *The length of the track may change. Pariticipants will be duly informed about this change. Think you have what it takes to be the best? Confident of your knowledge about the Mechanical realm? Show us @ The Quiz. Any facts, figures or references stated here are made by the author & don't reflect the endorsement of iU at all times unless otherwise drafted by official staff at iU. This article was first published here on 9th September 2014.